Also known as Lao Tzu. Semi-mythical Chinese philosopher and proponent of the way of dynamic non-action. The founder of the philosophy and religion of Taoism, and author of the Tao Teh King, which is included in the Liber E and A:. A:. Section 1 reading lists. The name Lao-tze can be translated as “Master Lao,” or “Doctor Lao,” or simply as “The Ancient Master.” Crowley considered him to be a Magus of A:. A:., whose Word was TAO, meaning “the true Nature of Things, being itself a Way or Going, that is, a kinetic and not a static Conception.” See Chapter 69 of Liber Aleph, Part III of The Heart of the Master, and Chapter 7 of The Book of Lies. Crowley claims that he was previously incarnated as a disciple of Lao-tze named Ko Hsuen. According to legend, Lao-tze was born to poor parents in the region of China now known as Hunan, in the time of the Emperor Ting of the Kau Dynasty (some say he was immaculately conceived to a shooting star, carried in his mother’s womb for sixty-two years, and born with white hair). His talents manifested early, and brought him to the prestigious position of keeper of the imperial archives at Loyang in Hunan. His reputation as a scholar and sage grew rapidly, and people began to come from all over China to partake of his wisdom; but he refused to the end of his life to set down his teachings in writing. While people flocked to hear his famous sermons advocating simplicity of life, he could tell that few, if any, truly listened to him. Ultimately saddened and disgusted by the perversity and stupidity of his fellow men, and their failure to understand his teachings, he resigned his office and retired to a monastery, dying in an unknown place. Some say he rode off alone on an ox toward the desert beyond the Great Wall. According to this legend, as he approached the gate, the gatekeeper recognized him. He came forward and earnestly implored him to record his ideas before he left. Lao-tze paused, impressed by the man’s sincerity, and decided to honor his request. He tarried briefly with the gatekeeper and produced a collection of brief essays known today as the Tao Teh King. Lao-tze may or may not have been an actual person. Some say he and the sage Lao Tan were the same person, others claim the philosopher Erh Li was the model for Lao-tze. In any case, after a brief period of initial suppression, the Tao Teh King gained considerable popularity and influence. Emperor Wu (566-578 e.v.) established Taoism as the third great religion of China, after Confucianism and Buddhism. 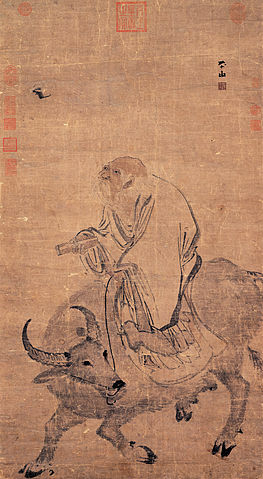 The later Taoists, in developing their sect, added many legends, miracles, gods, beliefs, rituals and superstitions to the simple philosophy of Lao-tse. Early Taoism also merged with a school of Buddhism to form a syncretistic Buddhist sect known as Chan, or Zen. The Tao-te Ching may be found here.